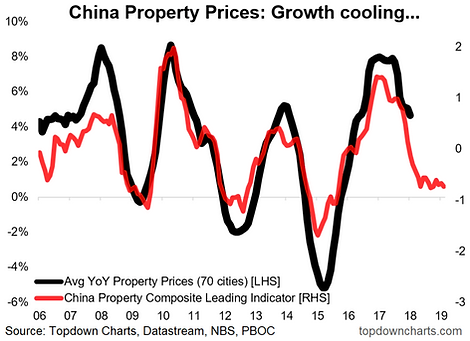 This week the “Chart of the Week” is focused on the outlook for China’s property market. The Chinese property market is perhaps one of the most important markets in the world, if not the most. What happens to this market has direct flow-on effects to global commodity prices, emerging markets and commodity producers, and considerable influence on the cyclical macroeconomic and risk backdrop domestically. The chart comes from a report on the outlook for China’s economy (and the impact on the balance of risk vs opportunity for Copper prices). Basically the chart shows the average year-on-year price change across the largest 70-cities in China against our leading indicator. The key conclusion being that the Chinese property market is about to head into a slowdown. The leading indicator incorporates interbank market interest rates, government bond yields, money supply growth, and property stock relative performance. Historically these factors have proven to offer a good lead on the outlook (and have helped me call tops and bottoms in this very cyclical market! ), and the economic logic behind these factors is sound e.g. interest rates have a direct impact on financing costs.